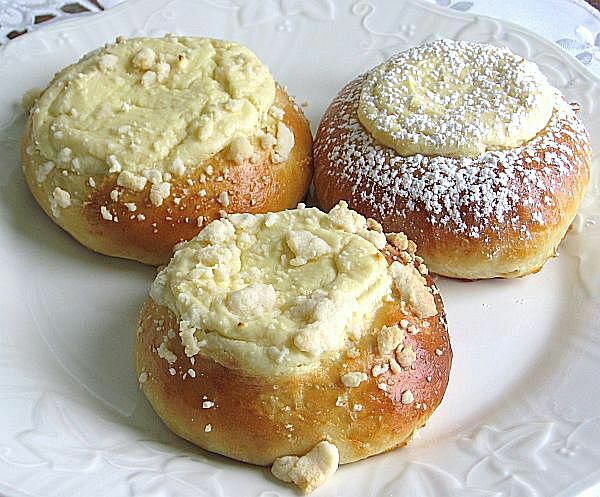 This recipe for Polish cheese sweet rolls or drozdzówki z serem (drrawz-JOOF-kee z SEHRR-em) is made with a slightly sweet yeast dough that is topped with sweet cheese curd filling. This dough can be topped with any fruit, almond or poppyseed filling and can be further topped with streusel, if desired. After baking, they can be sprinkled with confectioners' sugar or a flat icing. Although sweet rolls are usually considered a breakfast pastry, in Poland, they are served any time. In fact, the word drozdzowki actually means "buns" in English. Here is a larger photo of Polish Sweet Rolls. In a small bowl or glass measuring cup, combine yeast with 1 teaspoon sugar and 1/4 cup warm water. Set aside. In a large bowl or stand mixer, mix together with the paddle attachment 1 cup warm milk, butter, 1.4 ounces sugar and pinch salt, until the sugar has dissolved. Add eggs and yeast mixture, combining well. Add the flour and beat with the paddle attachment until well mixed. The dough will be very sticky, almost a batter, and that is fine. Scrape down the sides of the bowl and let rise in the same bowl, covered, until doubled. Punch down dough and turn out onto a lightly floured surface. Knead a few minutes to release the trapped air bubbles. Divide into 2-ounce portions. Using lightly floured hands, round each portion into a ball. Place on a parchment-lined sheet pan, spacing at least 2 inches apart, and let rise, covered, until doubled. Heat oven to 375 F. Using a lightly floured soup ladle bottom, make a depression in each ball of dough. Place a generous portion of filling in each depression. If using crumb topping, sprinkle it on now. Cover and let rise 30 minutes. Brush egg-water glaze around the sides of each roll. Bake 15 to 20 minutes until done. Cool completely on wire rack. If desired, when cool, dust with confectioners' sugar or drizzle on water icing.